What’s not to love about quesadillas? 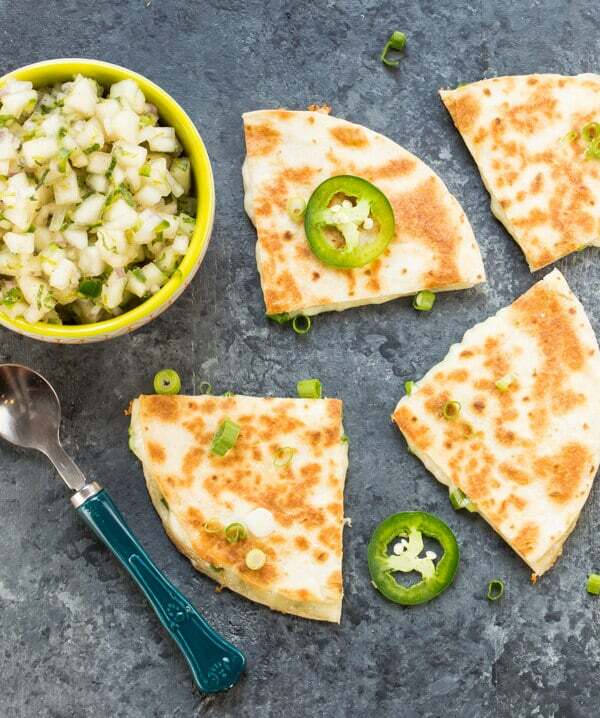 Their ooey-gooey cheesiness is adored by most everyone, and this meatless version of Monterey Jack Quesadillas with Pear Salsa is one of our favorites. The pear salsa totally makes this dish. It’s not the mouth-on-fire type of hot salsa that my husband loves to dip with his chips. No, we’re talking sweet, juicy pears that are well-matched to the amount of heat and spice in the jalapeño and black pepper. More like a sweet heat that’s very food-friendly. And the addition of mint is killer. Unexpected, yes, but it gives the salsa a bright, fresh flavor. When paired with the smooth, creamy melted Monterey Jack (sprinkled with a few savory green onions), you have a match made in heaven. Tip: Sometimes we eat these as a quick and easy dinner with a simple spinach salad, but they work equally well as a crowd-pleasing appetizer for guests. Feel free to use any pear you like in the salsa, but I’ve found that d’anjou pears are a little firmer (even when ripe) and hold up better to the acidity of the lime juice. Combine pears through jalapeno pepper in a small bowl. Chill for at least 20 minutes and up to a few hours. Heat skillet over medium high heat. Lightly oil or spray skillet. Add one tortilla, 1/4 of cheese, 1/4 of green onions and top with another tortilla. Gently press down on tortillas until the cheese starts to melt. Cook until lightly browned and flip over to brown other side. Remove from skillet and repeat with remaining tortillas, cheese and green onions. Cut tortillas into eighths and serve with pear salsa. This quesadilla combination looks wonderful. I love the pear salsa–definitely have to try this soon. Thanks, Julia. The pear salsa is a fun twist, isn’t it? The pair salsa looks great and I can’t wait to give that a try. Both Eli and Zoe would love this as an afternoon snack. BTW, I noticed that your cauliflower and my quinoa cakes are near each other on Foodgwaker’s most gawked for the past 30 days, buddies! Whoo hoo! Hi Jackie, we all grow as cooks, don’t we? Remember, that time in our lives was often just about getting THROUGH the day, not about fancy food preparation. 🙂 Can’t wait to try the quinoa cakes. That pic of the cakes with the cheese oozing out the sides is absolutely mouthwatering! 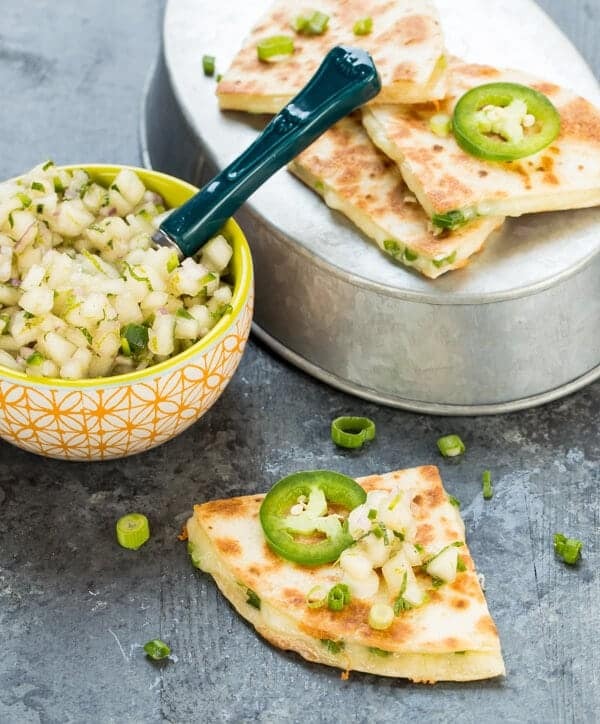 What a great idea to make a pear salsa to liven up a quesadilla recipe. Will definitely have to try this out soon. Let us know what you think when you give it a go. Thanks for stopping by, Justine! P.S. Love your food and beer pairing concept! I loved these quesadillas paired with the pear salsa! The salsa was unique and had a great combination of flavors. I featured your quesadilla recipe in my latest weekly meal plan on my blog, thank you! So glad you enjoyed the quesadillas, Emily!